I saw this quite official looking opportunity to import yahoo contacts into my Hotmail account, I do not have a yahoo account but I wanted to check out what kind of transfer process they were going to initiate between yahoo and hotmail. Now I have seen this done before with OAuth, and with this technique you are basically redirected to the target site where you can safely put in your credentials. However with this process I was redirected to another site that seems to be under the auspices of TrueSwitch. Now I have nothing personal against TrueSwitch, but I do wonder why would I trust any third party with not just one email and password but two. 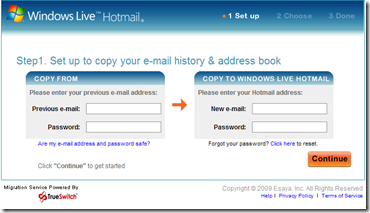 It begs the question why would Hotmail, a trusted name and brand, need to go to a third party for this kind of transfer when they have proven that they can use OAuth to fulfill this kind of information transfer. I can only assume that TrueSwitch is providing additional services that the OAuth process does not cater to (may be the Email history, who knows), either way there is zero chance of me using this kind of service when I have to give over the keys to the email kingdom. This is my final rant about transferring online information I promise, I just want to see a trusted standard implemented that does not encourage and involve password sharing!